(Newser) – It's a sign of just how much firepower Stephen Paddock had in his Vegas hotel room: Police were able to zero in on him because his weapons set off the room's smoke alarm, reports the Washington Post. Given that the Mandalay Bay Resort and Casino has more than 3,300 rooms, the clue helped police locate him more quickly—about 20 minutes in all—than had they been forced into a room-by-room search. 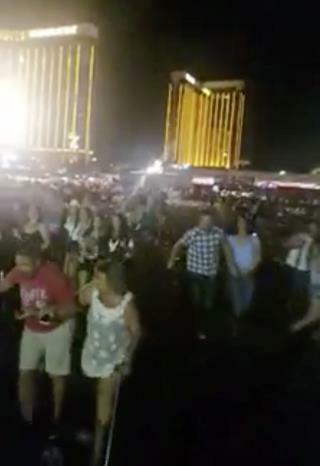 As it was, Paddock managed to kill at least 58 people and wound more than 500 others from his 32nd-floor room. "The way the shooter was identified was not from the muzzle flashes, but the smoke detector in the room went off from the amount of smoke that came from firing that fully automatic weapon," former Vegas police officer Randy Sutton explained to CBS, per the Week. First, I have found no evidence where either a fully, or semi-automatic rifle has been used successfully in a civilian self-defense situation in this country. Second, had every single concert goer been armed, not one fewer casualty would have resulted. Third, with no history of mental illness, this man likely legally obtained his arsenal. Whether or not he owned older automatic rifles which require an ATF fee to legally own, or whether he maybe illegally but easily modified them to fire in an automatic manner will be determined, but the question becomes, when one man can wound 500 people, why are we still so insanely kneeling at the Shrine of the NRA and allowing military arms to be sold in this country? There is no more or less appropriate time to look again at gun restrictions, any more than it is "inappropriate" to talk about climate change immediately after two massive hurricanes have struck U.S. territory in as many months. No waiting for reinforcements. Blow and go was the only option.